Work is has recently been completed on a £1.5m project to convert a four storey block at Phoenix school to a new ICT facility. The challenge presented by Hammersmith’s brief was to design a block that was more like a modern office block than a school, and with a ‘personalised learning’ teaching area where up to 90 pupils could be taught in one class at a time. 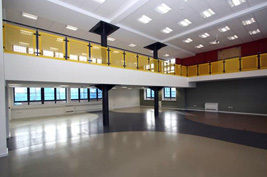 William Martin came up with an innovative solution which includes demolishing internal partitions between two classrooms, and a part of a structural floor between two more, to create a two storeyspace with a mezzanine floor.